The SX-500 serial server family allows sharing serial devices on traditional or wireless networks. 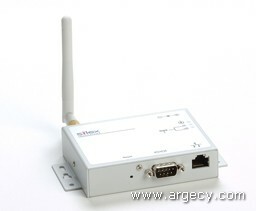 It can be ordered with a wireless option that provides 802.11g LAN connectivity in addition to Ethernet. The provided Serial Port Emulator software allows for easy integration with existing PC applications. The SX-500 serial servers include enterprise-level security features including access control lists, complete protocol and application enable/disable control, read and write configuration passwords, and SNMP community name configuration. The wireless models also add 802.1x Extensible Authentication Protocol (EAP) with Transport Layer Security (TLS), Tunneled Transport Layer Security (TTLS) Lightweight Extensible Authentication Protocol (LEAP); Protected Extensible Authentication Protocol (PEAP) or Flexible Authentication via Secure Tunneling (FAST); Open System or Shared Key support with Wired Equivalent Privacy (WEP) encoding; WPA (Wi-Fi Protected Access) Personal (WPA-PSK) and Enterprise modes, which utilize improved encryption via the Temporal Key Integrity Protocol (TKIP); and WPA2, which adds Advanced Encryption Standard (AES). The enclosure is made of rugged pre-plated galvanized steel with an IP40 industrial-grade rating. Side flange mounts allow for permanent installation on virtually any surface, or on a DIN rail using the optional DIN rail mounting bracket. The unit can withstand electrostatic discharges as high as 15 kV at the seria connector. In addition to a built-in web browser interface, Silex provides ExtendView, a Windows utility for easy configuration and management. A console accessible via TELNET or the serial port is available for more sophisticated diagnostics and configuration. The SX-500 series is also compatible with the Simple Network Management Protocol (SNMP) for compatibility with most popular network management systems. The included Serial Port Emulator software allows you to configure virtual serial ports on a Windows system (for example, COM3) that redirect all of thedata out to the silex serial servers on your network allowing you to continue use of your current applications. Silex wireless serial servers have been tested extensively to support the security methods used in leading access points and radius servers.